The Milwaukee Brewers aren’t usually a team that goes after high-priced free agents. But things may be different this winter. There are reports that the Brew Crew is hoping to add a frontline starting pitcher this winter. 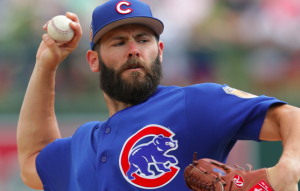 Specifically, the Brewers have their eye on two pitchers who took the mound for a pair of division rivals last season, Jake Arrieta and Lance Lynn. On the surface, it’s surprising to hear that Milwaukee could be a serious contender for someone like Arrieta or Lynn. Outside of Yu Darvish, they are easily the best starting pitchers on the free-agent market this winter. However, the Brewers proved in 2017 that they are nearing the end of their rebuilding project. Even with the Cubs appearing to have a strong hold on the NL Central, the time could be right for Milwaukee to make a serious push for a playoff spot. The Brewers are also in a good position financially. Other than Ryan Braun, they don’t have many players who are making a large amount of money. They enter the offseason with a great amount of payroll flexibility. This allows them to at least consider the possibility of spending a large sum of money on a single player. Based on their 2017 season, a bonafide ace at the top of the rotation could be the thing they need to take them to the next level. In 2017, the Brewers received consistent production from the trio of Zach Davies, Chase Anderson, and Jimmy Nelson. Junior Guerra, who was great in 2016, and veteran Matt Garza are also rotation options heading into 2018. The Brewers also have a promising group of youngsters in Brent Suter, Josh Hader, Brandon Woodruff, and Luis Ortiz. However, none of Milwaukee’s pitchers are as established as Arrieta or Lynn. The Brewers are also likely to be without Nelson for the first part of the season after undergoing shoulder surgery. Clearly, Milwaukee has a need for a frontline starter. They also have the means to make something happen. Of course, that doesn’t guarantee that the Brewers can make something happen. Arrieta could command a deal in the vicinity of $100 million while Lynn would require a commitment of at least $50 or $60 million. Signing either, particularly Arrieta, would certainly make a big splash for the Brewers. But it could also keep them from making any other significant additions this winter. That being said, the Brewers appear to be serious about adding a frontline starter and should be seen as threats to sign at least one of them. They’re bound to face some competition for both starters, so the Brewers could find themselves in a high-end bidding war, which would be a new position for them. But at the moment, they are showing genuine interest in both Arrieta and Lynn and could push hard to sign one of them this winter.